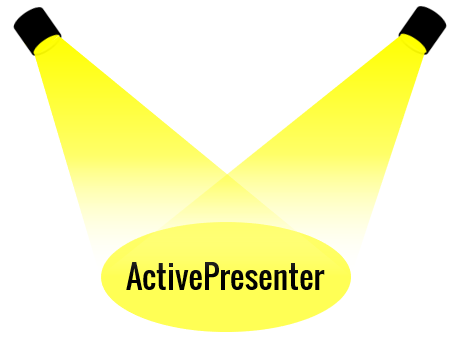 Spotlight is a useful annotation object in ActivePresenter. 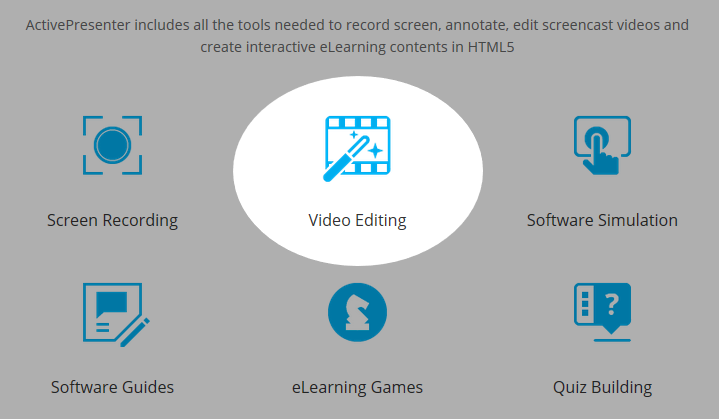 It helps you easily direct your audience attention to a specific part of a slide. 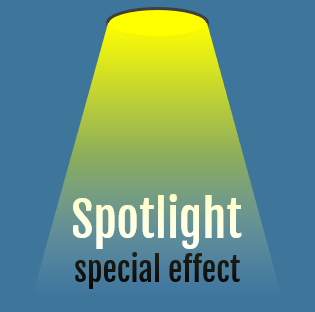 In this tutorial, you’ll learn how to create a spotlight effect in ActivePresenter 7. Step 1: Click the Annotations tab > Spotlight. A spotlight object is immediately inserted in a slide. It retains the original brightness within the spotlight shape while darkening the rest of the screen. Step 2: Resize and reposition the spotlight object as you wish. You can drag the resizing handles (green dots) to change the size and drag the object to a new position. 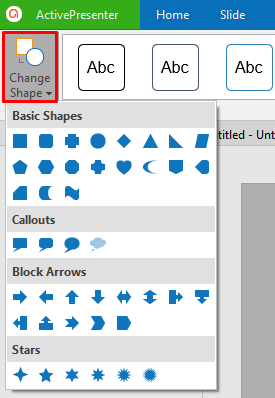 Step 3: Optionally, change the spotlight shape by clicking the Format tab > Change Shape > choose a new shape. 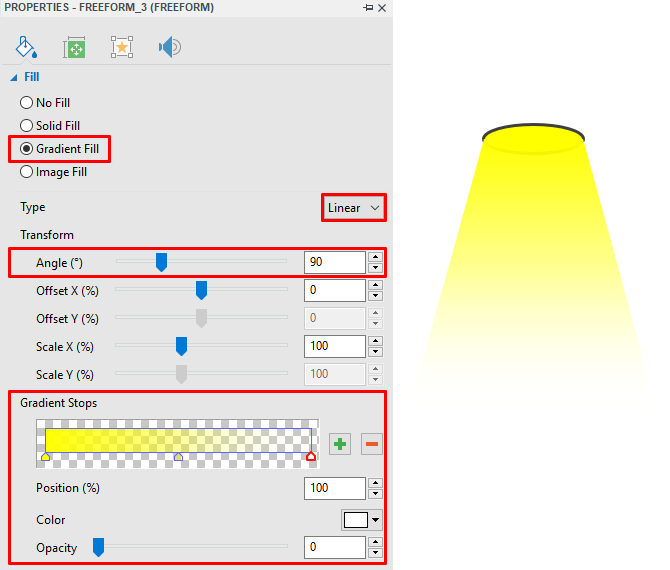 Step 4: Optionally, adjust the transparency level of the area surrounding the spotlight shape. 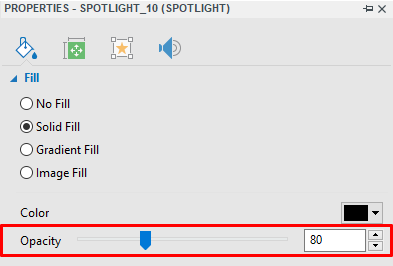 Just select the spotlight object, click the Properties pane > Style & Effects > Fill > Opacity. Note: Another way to draw attention to an area is using highlight objects. Highlight is a transparent, colored rectangle shape that can be placed over a certain area on a slide to highlight that area. Insert this object to a slide by clicking the Annotations tab > Highlight. ActivePresenter allows you to create this effect by using shapes and gradient background fill. Let’s see how to make the effect from scratch. 1. Draw an oval (Annotations tab > Shapes > Oval). 2. Change the Solid Fill color to yellow (Properties pane > Style & Effects > Fill). 3. Switch from No Line to Solid Line (Properties pane > Style & Effects > Line). Change the light color and width if you want. 1. 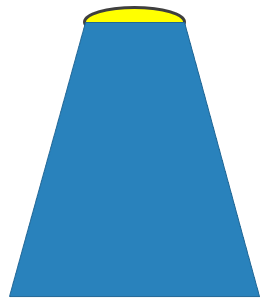 Draw a trapezium for the light beam using the Freeform Shape drawing tool. Then, place the light beam under the light source. 2. Switch from Solid Line to No Line. Stop 1: Position 0%. Yellow. Opacity 255 (non-transparent). Stop 2: Position 50%. Yellow. Opacity 100 (semi-transparent). Stop 3: Position 100%. White. Opacity 0 (fully-transparent). That’s all about spotlight effects in ActivePresenter. Hope that this helps. Don’t forget to subscribe to our website so that you’ll be alerted with all future tutorials.